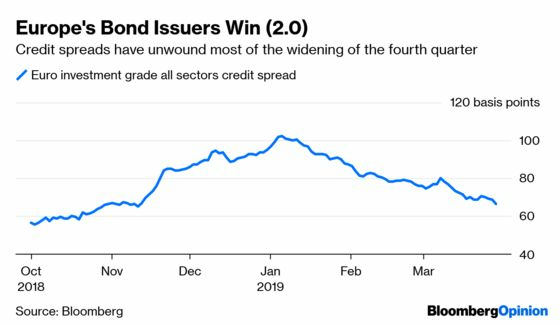 (Bloomberg Opinion) -- After the disaster in the fourth quarter, the first three months of 2019 were surprisingly favorable for companies to issue debt. Any corporate treasurers contemplating coming to the market ought to accelerate their plans before investors go on strike. For borrowers, it rarely gets much better than this. 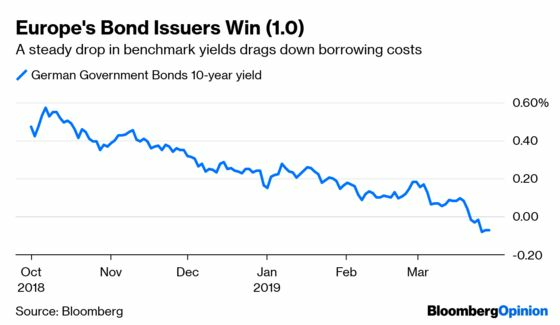 Investor demand is running hot — the hunt for yield is in full force, even as the euro-area economy slows down. And there is a double bonus: falling underlying benchmark yields…. ...combined with steadily falling credit spreads across all sectors. That means the cost of raising new money has fallen substantially, in some cases by over 100 basis points. New investment-grade corporate bond sales were about 50 percent higher than the first quarter of 2018, at about 100 billion euros ($112 billion). More than 90 percent of deals completed in the quarter are tighter than their spread at pricing. “Reverse Yankees” — U.S. companies issuing euro-denominated bonds — were the stars. The Coca-Cola Co., International Business Machines Corp. and Altria Group Inc all featured with substantial deals. Verizon Communications Inc. and Metropolitan Life Global funding are set to continue that trend into the second quarter. It makes sense for these large multinationals to secure local funding with rates this low. Were this only a matter of firms arbitraging better rates and swapping back to dollars, the Americans would be dominated by banks. 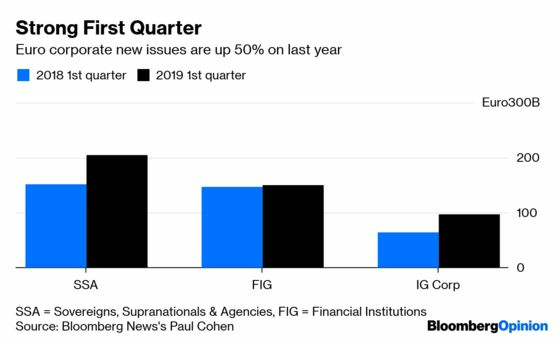 Among the region’s borrowers, the dominance of consumer companies and automakers means there was relatively little issuance from industrials, utilities and telecoms, so these sectors could be more active this quarter. How this will play out? The end of the European Central Bank’s corporate sector purchasing program removed the biggest buyer in the room. Though bund yields are barely 10 basis points off their record low in 2016, it’s hard to see another great slug of central bank stimulus will come soon to drive them much lower. And investors can easily run out of patience with yields this low. However, if bund yields stay negative they may not have much choice but to accept them. For companies that need to get their borrowing requirements settled, if they wait much longer, then they must be feeling pretty lucky.